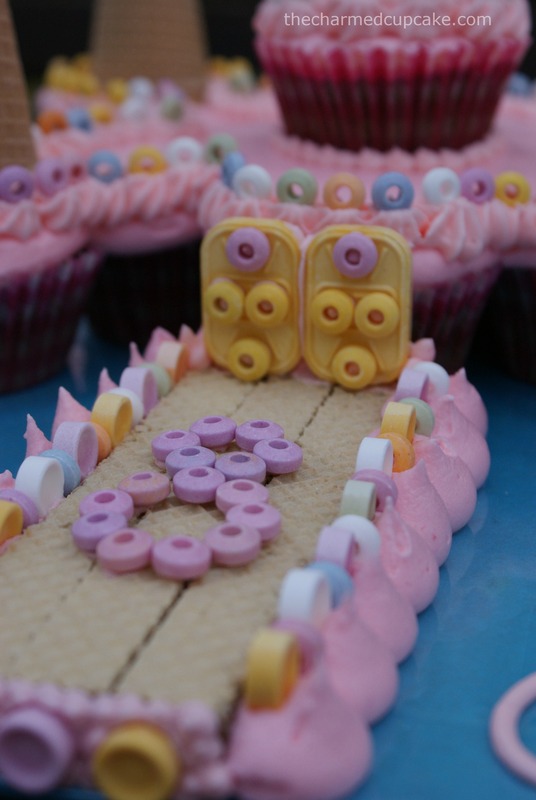 Cupcakes in my path! With them I shall build the sweetest castle ever. If you follow me on Facebook you would have seen this beautiful castle I made back in October. 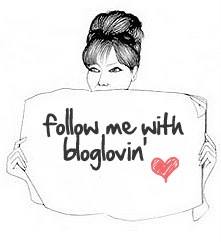 Yes it’s taken me awhile to get this post up but it’s finally here! I’ve had a few requests as to how I made this beautiful, sweet, pull-apart cupcake castle cake so I will share with you how I put it all together. Please do excuse the indoor photos as it was late in the evening and I used my phone camera to take the pictures but at least you get the idea. 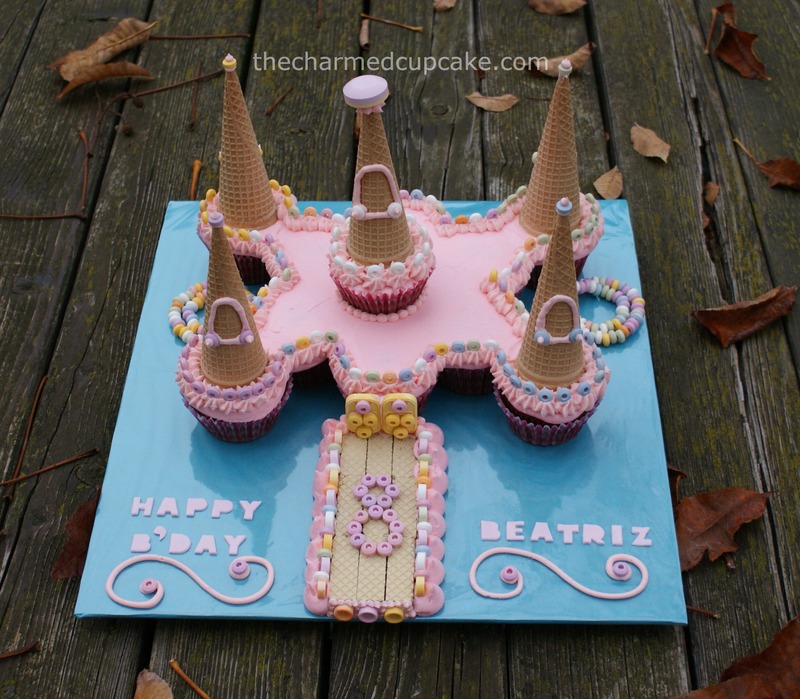 Beatriz celebrated her 8th birthday and this time she requested for a castle cake. A year ago it was the Madagascar movie theme as she celebrated it at the movies but this time round she was celebrating at the Linz castle museum so it was only appropriate she request a castle. 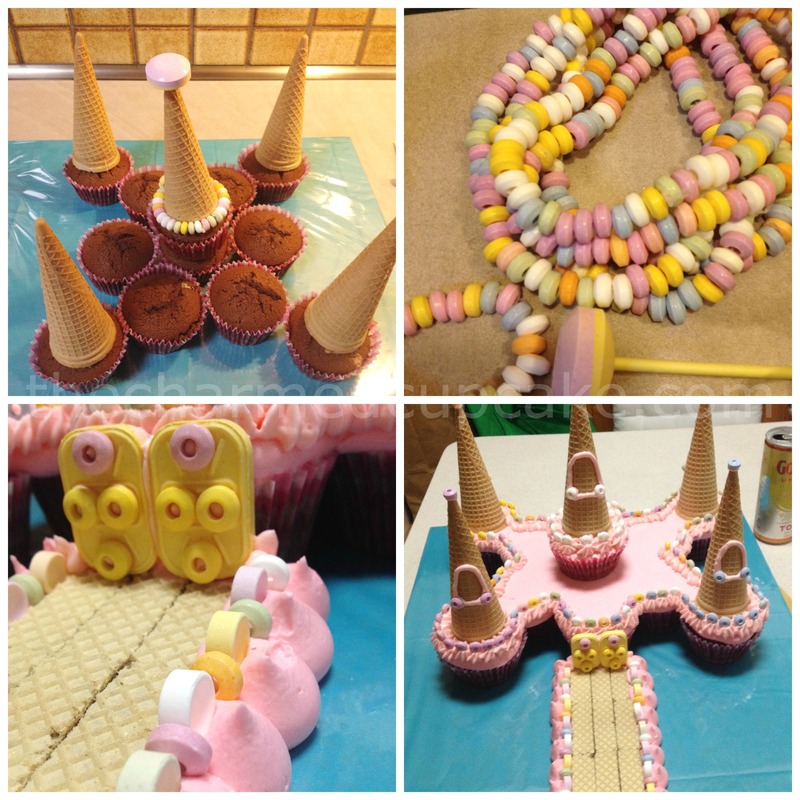 Here you can see I was playing around with some ideas but they were more than 12 cupcakes! You see I had strict instructions that the cake was to be made with only 12 cupcakes. At first I thought that was not possible and after playing around with the cupcakes and helpful text messages from a girlfriend, I managed to find a design I was happy with. Now you must please excuse the gin and tonic can in the picture 😉 It was late in the evening and after rushing home from work I immediately started on the cake so I had no dinner. God bless Mr Charmed who showed up with Chinese take-out and a gin and tonic. OK back to the cake. As you can see I managed to find a design using only 12 chocolate cupcakes, of course you can use more. Once you find the design you like be sure to stick your cupcakes down with a tiny blob of buttercream. This is stop them from sliding around when you transport the cake. To frost the cupcakes I used my standard buttercream frosting tinted pink and a piping bag with a round nozzle tip or you could just cut the tip off the piping bag and pipe the frosting all over. To get the smooth finish on the frosting I used a metal spatula or the smooth end of a knife, dipped into boiling hot water, wiped off the water and smoothed out the frosting. 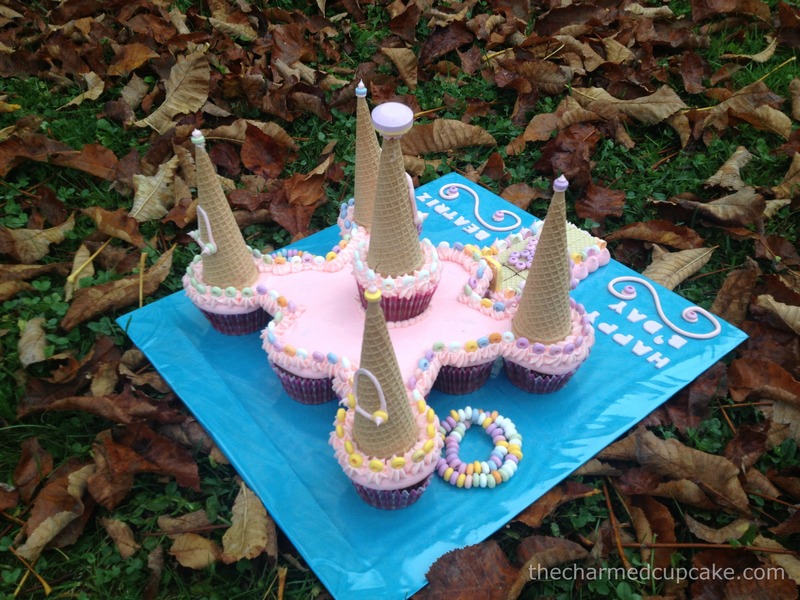 For the towers I used ice cream cones and the pastel decorations was a bag of sweets which I’m sure you all remember from our childhood. You know the ones – the necklace and bracelets sweets. The bracelets are supposed to be a watch as it has a rectangular disk which states the time. I used these as the castle gates and just covered up the text with the round sweets to form a design. For the bridge I used Manner wafer biscuits or any wafer biscuits that you can find in your local supermarket. Just remember to stick them down with a bit of buttercream. Once this was all done I started to pipe the ‘castle wall’ with a star tip, a large plain round tip for blobs around the bridge as ‘large stones’ and a small plain round tip for the windows. I used the sweets all around the ‘castle wall’ & ‘bridge’ and colour coded each tower. Remember to pipe small blobs of buttercream at the base of the lollipop on the middle tower just as added anchorage. The only fondant used here was the ‘Happy B’day Beatriz’ text, other than that it was all buttercream and sweets. You can even fill the inside of the ice cream cones with sweets so the kids get an extra surprise. Here is a side/back picture of the cake. As you can see the middle tower had a tiny crack at the base but the buttercream kept it all together. 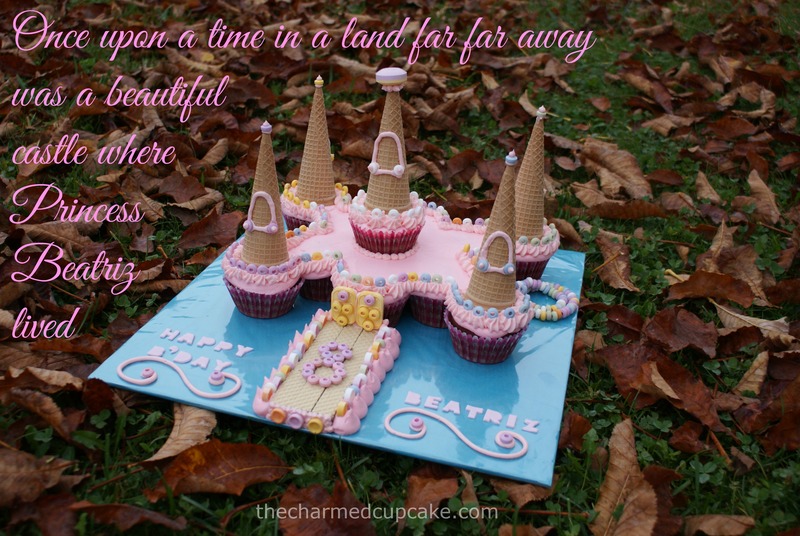 So there you have it, the sweetest cupcake castle of the land! It’s pretty straight forward once you know how. It does take some time to decorate but you will be greatly rewarded once you hear the joyous screams and cheers from the kids. It’s a cake they will never forget. 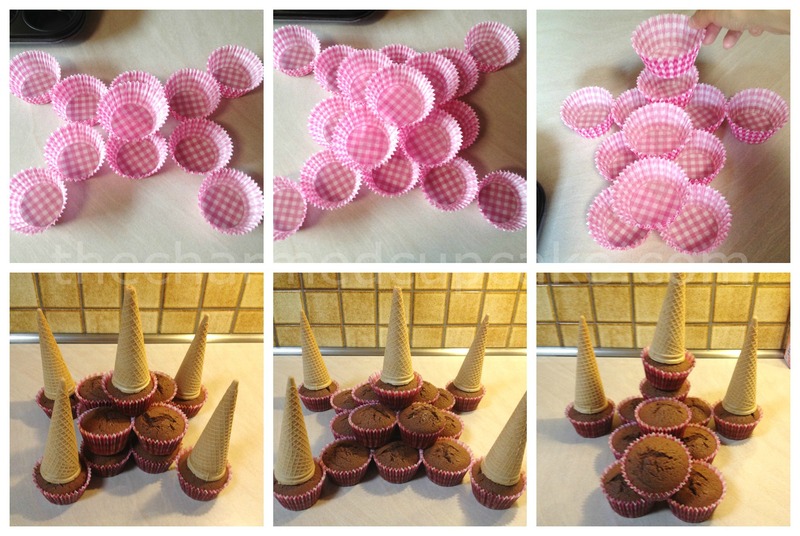 absolutely amazing idea to turn many small cakes into a big one. Love it. I just found your blog- I love cupcakes more than any food in the entire world so I had to check it out! Plus my dad’s family is Austrian 🙂 Looking forward to reading more from you and trying out some recipes! Thanks for the lovely comment, who doesn’t love cupcake 😉 I’m glad you stopped by. The more the merrier for me! Oh wow Angela, this is gorgeous! It’s just great! I do remember this from photos. And it must’ve been fun watching the kids pulling the castle apart – or was it?! 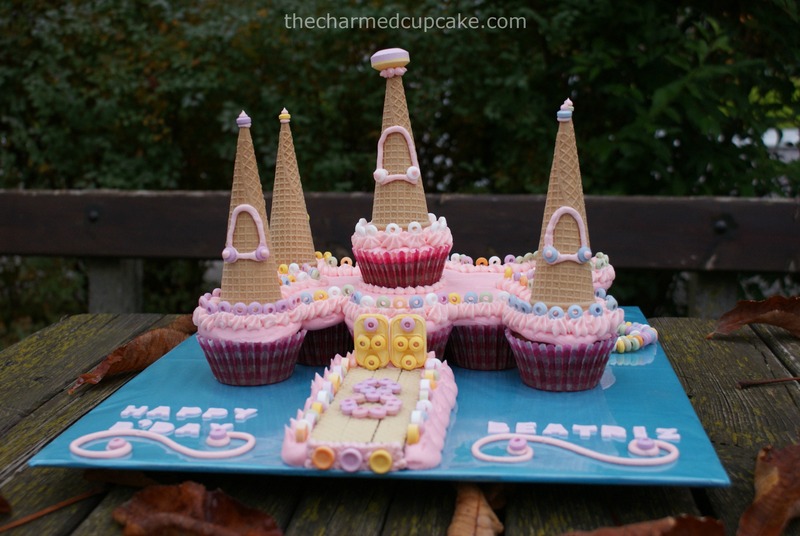 Dreamy cupcake castle! 🙂 Nice job!